The MaxiComfort Cloud with Twilight positioning using our patent pending 3-motor cradle technology offers an array of rejuvenating options to ease the body and mind. Twilight positioning is like no other seating system in the world. Its many health benefits include achieving a back angle that is similar to standing, putting less pressure on the spine and reducing spinal muscle fatigue. Our 30-degree angle takes the usual TV watching and zero gravity positions to a whole new level. Only Twilight offers a TRUE zero gravity sensation. Prepare for an exceptional seating and recline experience! 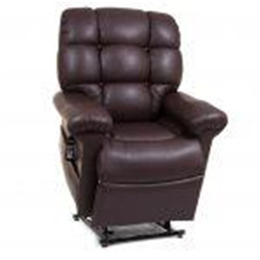 Floor to Top of Foot Rest Reclined 25"
Floor to Top of Back Reclined 25"
Distance Required from Wall Reclined 24"
Extension Reclined from Back Seat to End Foot Rest 43"
Warranty on Electrical Parts 3 Yr.
Warranty on Mechanical Labor 3 Yr.